The proper amount of Insulation can save you a considerable amount of money on your heating and cooling Bills! 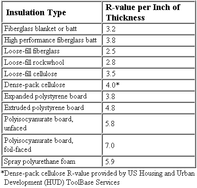 Between several different types of Insulation, and many different R-Values, the process itself is rather basic. I will discuss the use of the more common Fiberglass Batt Insulation and Blown-in Cellulose Insulation, considered 'green Insulation,' made with 80% post consumer recycled newsprint. 1. Gaining access to your crawl space is paramount! Whether installing Fiberglass Batt or Blown-in Cellulose Insulation, you will need to fit through the opening. This means that you may need to locate joists and cut an opening, in a finished ceiling, large enough to accommodate yourself and any tools or materials you will use. 2. Face the barrier down towards heated living space, when using Kraft paper-faced Fiberglass Batt Insulation. You must lay down a polyethylene vapor barrier first, when using unfaced Fiberglass Batt Insulation, or blowing in Cellulose Insulation! A vapor barrier helps to keep condensation from forming inside of the insulation. Damp insulation loses R-value, and may contribute to mold, mildew, rot and rust any metal which it contacts. 4. Turn the paper outwards, against the wall, when insulating an outside wall of an unheated crawl space with Kraft faced fiberglass Batt Insulation. Remember, the vapor barrier always faces the warmer/heated side. In summer weather, that exterior wall will absorb more heat than the cooler crawlspace. 5. Maintain a 3 inch air space around recessed lighting fixtures, to prevent heat build up and potential fire hazards. You should use a galvanized sheet metal tube/shield, approximately 10-12 inches tall, and insert it around recessed lighting fixtures, whether blowing Cellulose Insulation or laying Fiberglass Batt Insulation. The same can be said for heated exhaust pipes or flues. You can find this single-wall 'stove pipe' at most Hardware stores and Home Centers. Cut it to length with sheet metal shears, snap the seam together and install. Never use flammable cardboard in place of galvanized sheet metal as a heat shield. 6. Use soffit vent chutes or baffles which allow for needed intake air, when blowing Cellulose Insulation. Be sure that Fiberglass Batt Insulation does not stuff the openings, for the same reason. A vent system allows adequate air circulation for the removal of excess heat and condensation. In many cases, Gable vents on either side of the crawl space are needed to exhaust excess heat which would otherwise shorten the life of your roofing and siding. 7. Cut Batt Insulation to size, by using a straight edge and a utility knife. Fluff it to full height when installed, since Insulation relies heavily on trapped air within the fibers. 8. Blowing in Cellulose Insulation takes two people. One breaks apart the bales of Cellulose material and feeds the hopper which shreds and fluffs the insulation and blows it through a 3 inch diameter flexible hose. The person on the other end fans the hose back and forth maintaining an even depth of insulation, to achieve the desired R-rating. Two-way communication makes this job so much more efficient, since the supply of Cellulose must stop while the person on the business end of the hose repositions himself. * During the warmer Months, this is a job best done first thing in morning! * If you have a tight crawl space, Cellulose Insulation can't be beat! * Cellulose Insulation easily fills odd shapes and contours, and surrounds pipes, wires and electrical boxes. * In place of galvanized stove pipe, you can use aluminum sheet metal to form a heat barrier. But, be sure to secure the tube with rivets. Staples could rust and release - allowing the insulation to contact your recessed light cans, heated exhaust pipes or flues. 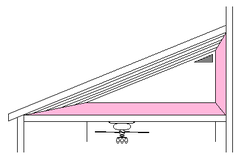 * Lay a piece of plywood down as a work platform, to keep from accidentally breaking through the ceiling.